This a prominent site in the Waverley valley, visible from many points along the Old Town ridge but also at angles along the valley. 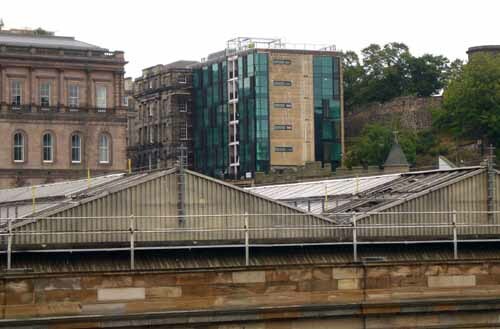 The extent and vivid colour of glazing created a certain amount of discussion back in 2007.
the building as existing comprises an odd coupling of the category A listed neoclassical former old post office, completed 1819 by archibald elliot and joseph kay, together with its 1960’s rear extension, built onto the hillside adjacent calton cemetery and towering precipitously above calton road. 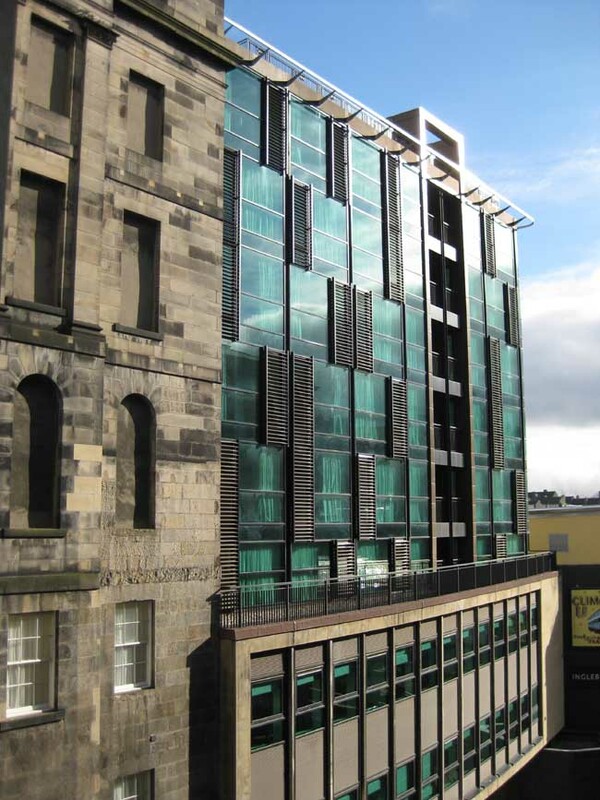 the listed building was damaged by fire in the 1950’s and rebuilt internally with a concrete frame as part of the renovation which saw the addition of the rear block in 1967. the scottish executive was the last owner of the buildings and offered the site for sale in 2002. our clients, b.l. developments ltd., acquired the site as the successful bidder based on our designs for conversion to residential. 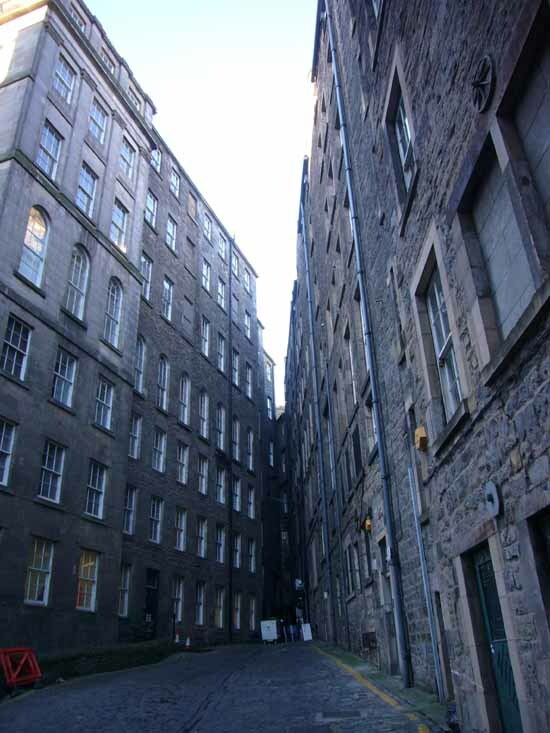 the building amounts to eight storeys with four above and three below entry level at waterloo place. 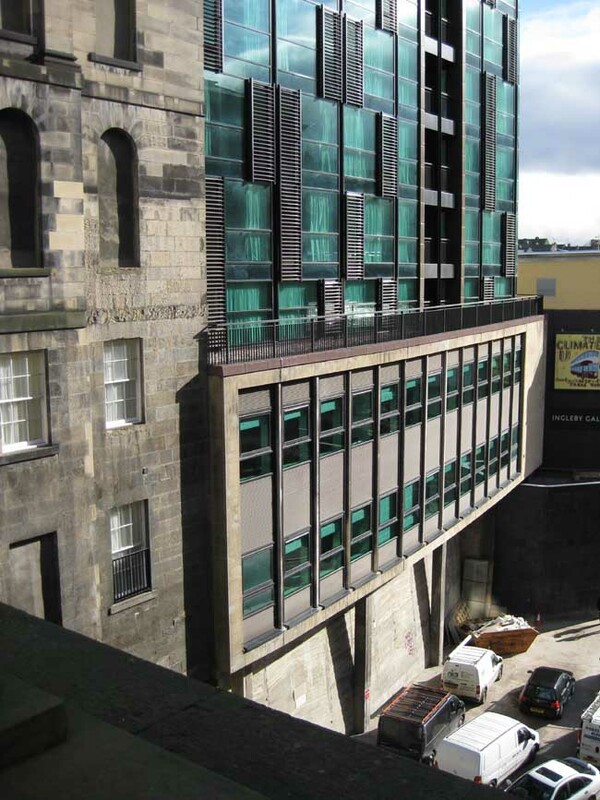 the lowest two storeys take the form of a podium with curved façade and are themselves approximately two storeys above the level of calton road, which provides the lowest access point to the buildings. the unusual setting presents strong contrasts in the building’s relation to its surroundings. waterloo place conveys an impression of the civic aspiration and grand scale of the scottish enlightenment and offers an almost eerily quiet introduction to the commercial bustle of princes street. 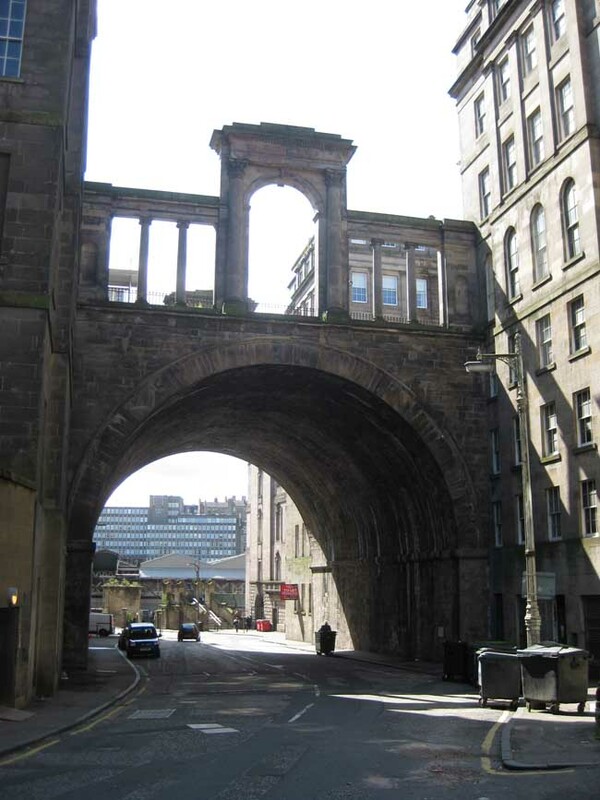 the west façade overlooks calton road as it approaches the imposing void beneath waterloo bridge. 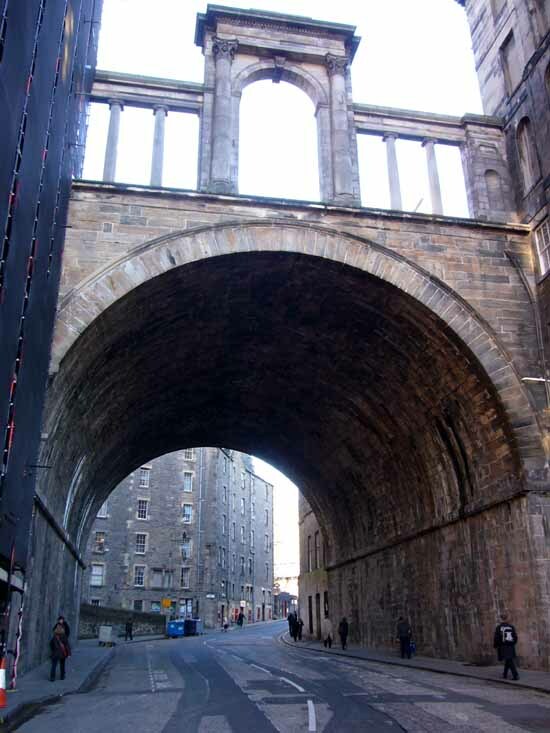 this deep urban ravine, sandwiched between this and the later constructed former post office building, has a dramatically urban character and opens to wide views over waverley station to the old town and castle beyond. 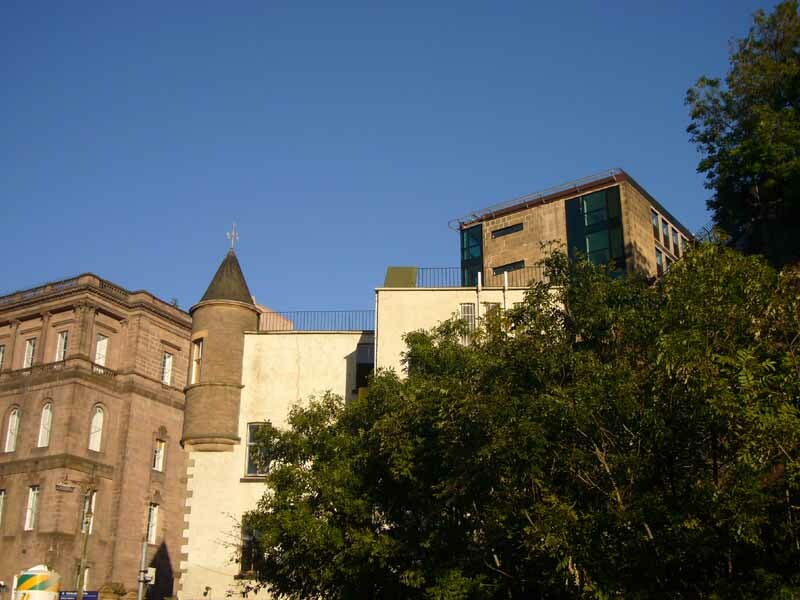 the south façade addresses the lower reaches of the old town and arthur’s seat, while the east façade overlooks the quiet monumentality of calton cemetery. finally, at roof level (presently inaccessible) there are exhilarating views of calton hill, the forth estuary, holyrood park and the city at large. conversion of the former offices accommodates thirty seven residential apartments with no car parking. the design proposals respond to the characteristic aspects of the buildings and their surroundings in order to offer a variety of accommodation and experience apposite to the drama and context of this unusual urban setting. 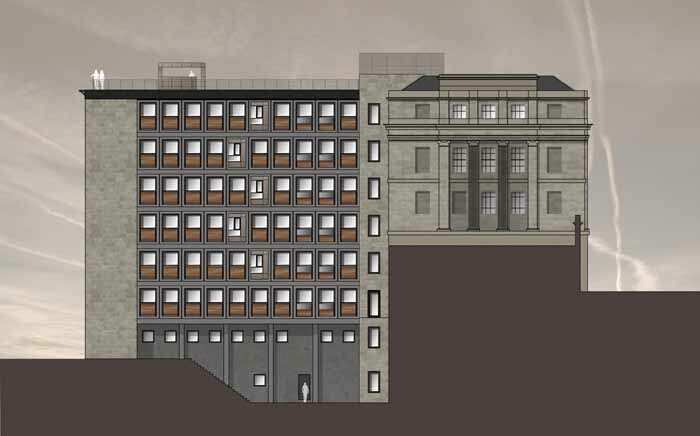 the building has an almost schizophrenic character, leading you from the ordered neoclassical civic realm of waterloo place, almost without warning, to the dramatic vertiginous space over calton road and the wide panorama of city and landscape to the south. 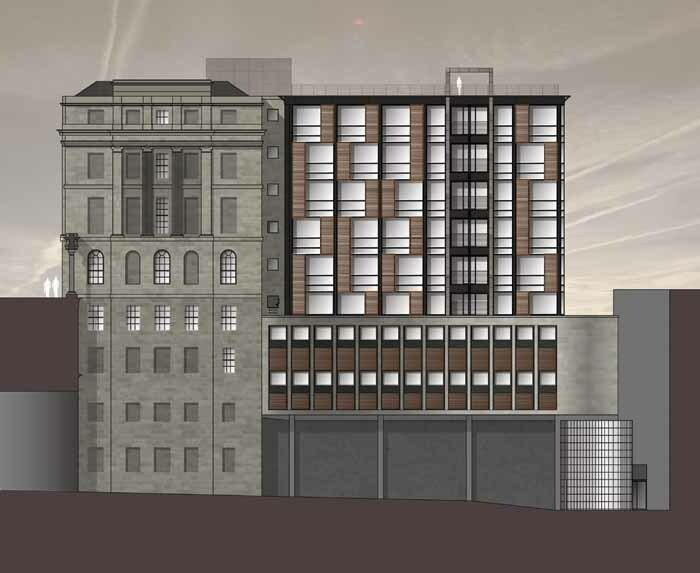 a contrast which will be highlighted on arrival at the new roof terrace as the ultimate destination of the public route through the building and common amenity space. none of the original features of the listed building survived the fire and reconstruction of the 1960’s. 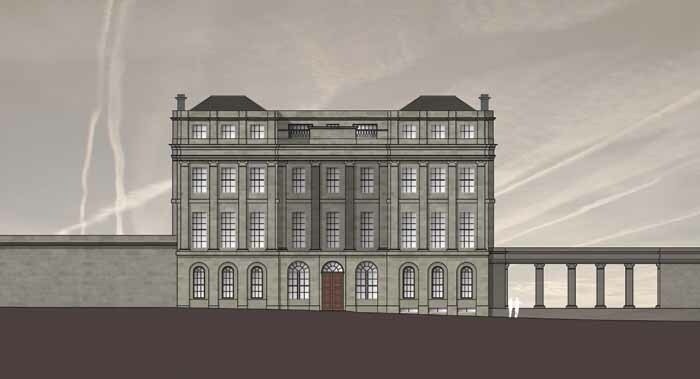 our approach to conservation in this part of the building, therefore, has been essentially to re-order accommodation to form living spaces commensurate in size and proportion to their storey heights, aspect and formal setting and making best use of existing windows and other features. 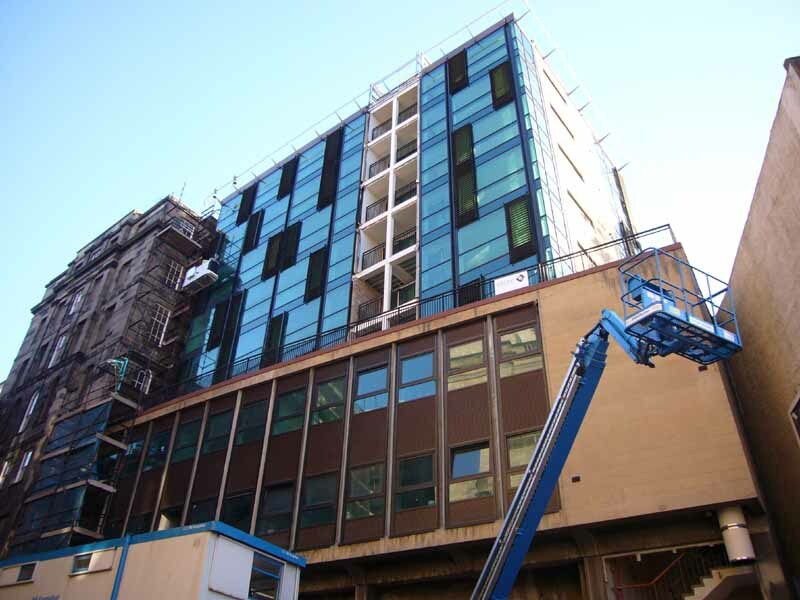 the rear extension is itself to receive a further 1.5m deep, six storey steel framed extension to its west façade. this extra depth allows three apartments per floor to be accommodated. the panoramic views to the south and west are exploited by floor to ceiling glazing. fixed louvre screens attached to the curtain walling provide protective barriers in front of full height opening lights for ventilation. 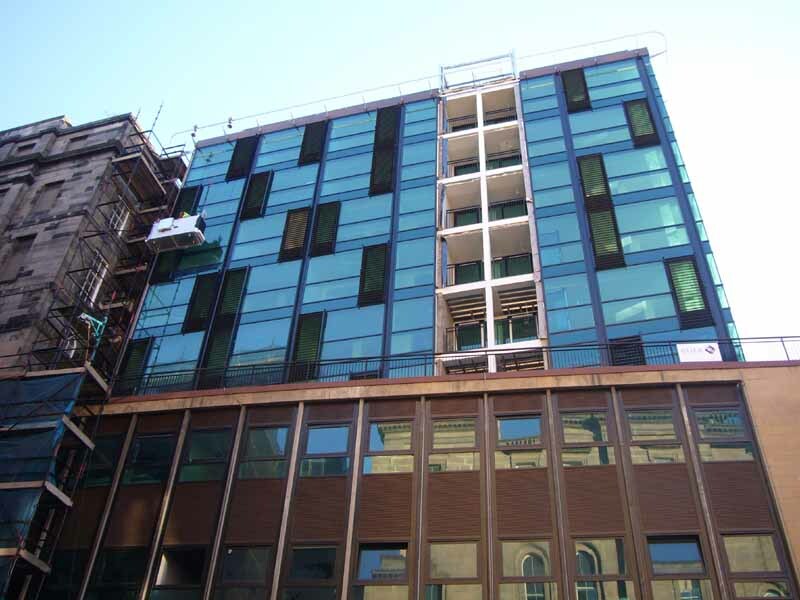 the curtain wall glazing is otherwise fixed and will be cleaned by cradle monorail system. the combination of tinted glass, strongly defined fenestration and louvre screens, together with the seemingly random pattern of their installation, is intended to suggest notions of privacy and individuality and form a coherent framework within which the variety of screens, curtains and furnishings ultimately installed by the various occupants should not appear conspicuous. private terraces are also provided to each of the large flats on the west façade. they are recessed into the façade and stacked vertically and their enclosure is defined by a vertical element which terminates in the form of a rooftop pergola. 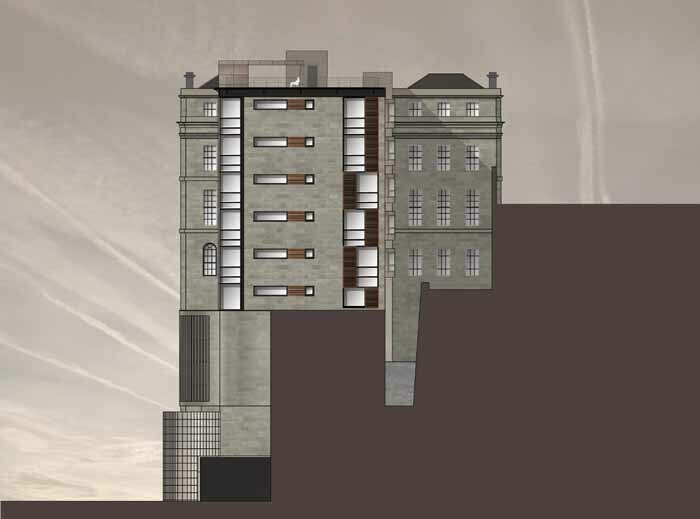 this formal device breaks the existing obtrusive mass of the building as seen from distant views in the city, such as at market street, jeffrey street and north bridge, and seeks to model the building more sympathetically to the rich interplay of structures and landscape which forms the backdrop of calton hill. 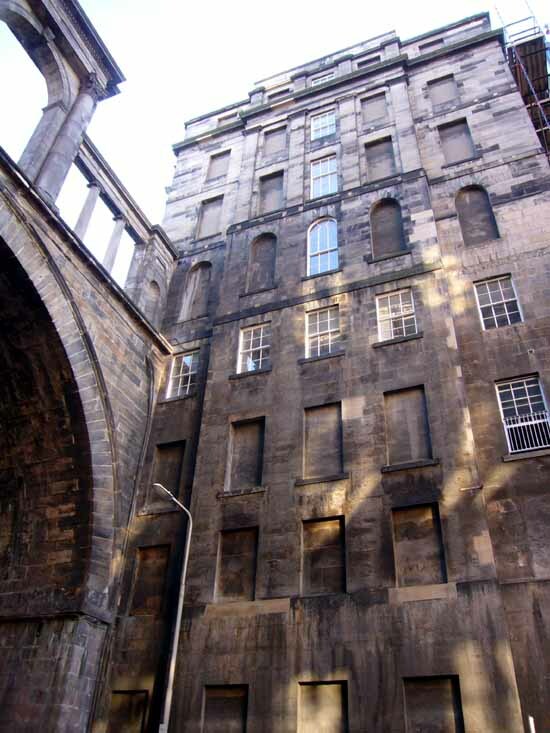 in contrast, the east façade overlooks calton cemetery and has a much more intimate aspect. the character of the graveyard is inherently more meditative and the east elevation is fitted with projecting window boxes which break the form of the otherwise monolithic façade and respond to the three dimensional play of tombs and monuments below and offer the sense of a quiet, introspective space for reflection and reading, perched securely outwith the edge of the structure. the listed building, therefore, is seen as the anchor which holds the development in a secure and familiar location in the city. the extension building is then modified to present elevations of appropriately contrasting character. facing the city and distant landscape the west and south facades are modelled on a large scale and present an urban demeanour. modelling, in the form of private terraces, are recessed into the façade to afford a sense of protection to the occupants. in contrast, the east elevation contains smaller scale projecting window boxes to suggest a more intimate relation with the quiet setting of the graveyard. 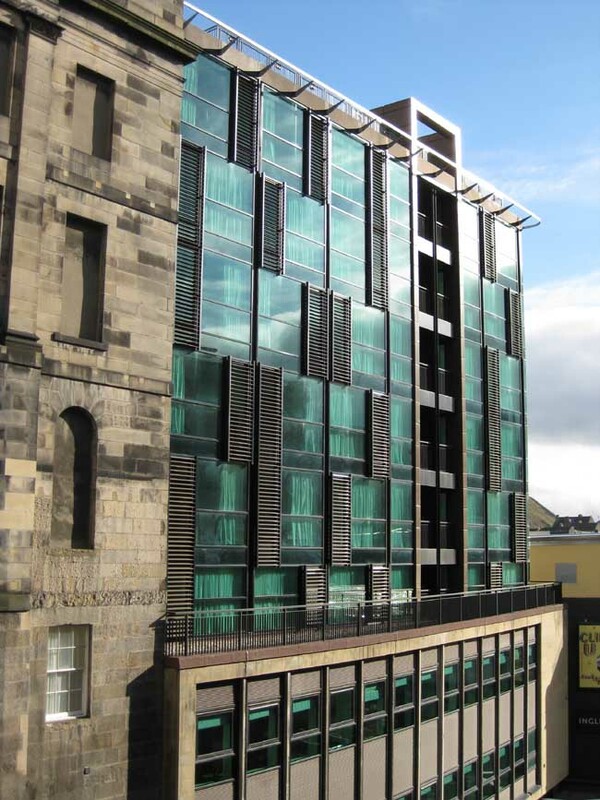 Another BL developments project in Edinburgh is Shrub Place, with Broadway Malyan Architects and Morgan McDonnell Architecture Ltd.